DICAD Systeme GmbH is a software house that ist leading in Germany in der field of CAD structural design. As a result, there is a great deal of feedback from users‘ experience on how engineering firms and precast plants in Germany work with CAD in actual practice. During recent years, an increasing number of engineering firms and precast plants have changed over to 3D-CAD design for housing construction, engineering structures, civil engineering works and precast construction. The greatest advantages for users are minimization of errors, visual project presentation to project partners, rapid generation of additional sections and views, quick quantity surveys, as well as error-reduced changes in models and, accordingly, in all 3D drawings. As a result, more and more offices and plants are opting for 3D design. This, however, is not to say that everyone is already working with BIM - but it is a big step in that direction. Genuine BIM projects in which process chains and communication are oriented toward BIM are currently more likely in trial stages. The more experience gathered in this field, the more extensively BIM will be used in practice. Since all project praticipants must cooperate in this effort, full-coverage BIM processing of projects in Germany will take some time. 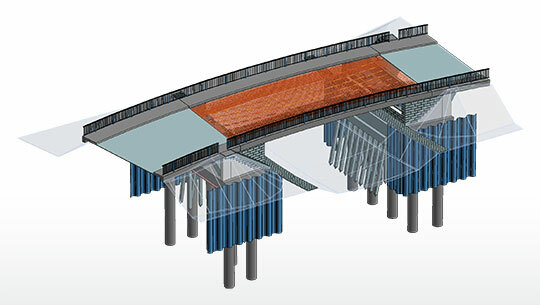 It is essential that structural engineers utilize good BIM-capable CAD software, which is fully ensured by using STRAKON from the STRAKON aus dem company DICAD.